FROM THE BELGIAN BORDER - Again a Belgian, who tried to flee over the border to Holland, was caught in the electric barbed wire and was killed by the high voltage. (Newspaper article of every day). This political cartoon and caption, by Albert Hahn, appeared in the Dutch weekly magazine De Notekraker in the year 1915. It is little known that the German occupation force in Belgium in spring 1915 erected a high voltage electric fence between Belgium and the neutral Netherlands. The 2.000 Volts wire ran almost 200 Km (125 Miles) long through villages, orchards, meadows, woodland, over brooks - even over the river Meuse. The height of the construction was over 3 meters. On this picture the wire is seen from the Dutch side. The main purpose of the wire was to guard the Belgian-Dutch border. Border patrol required so many soldiers who could be deployed elsewhere, that the German occupation authorities choose for this 'efficient solution'. In the first weeks after the war started, Belgians began to cross the border to Holland. In autumn 1914 already one million Belgian refugees stayed in the Netherlands. In the next months many of them returned. Eventually about 100,000 would stay, until the end of the war. But during all years of the war new refugees kept coming and, almost daily, tried to cross the border. Their reasons to flee were diverse: some felt unsafe in their German occupied country, others wanted to join their relatives who had already fled. Many also wanted to take part in the war and choose this detour to join the forces on the allied front. A victim lies between the contact wires. How many people the fence killed is unknown. Estimates vary from 2,000 to 3,000. Local newspapers in the south of Netherlands (bordering Belgium), from spring 1915 on, carry almost daily small messages about people 'lightened to death'. Not every crosser died though. Many also succeeded in crossing the dangerous border. Today people whose (grand)parents lived here, still can show you wooden sash-windows and casks, used to force a safe entrance through the entanglement. Sometimes they also used very long wooden ladders; when applied from both sides they worked as a scaffolding. The fence also drove family's and friends apart. Funeral-processions used to walk to the fence and halt there, to give relatives and friends on the other side the opportunity to pray and say farewell to the deceased. 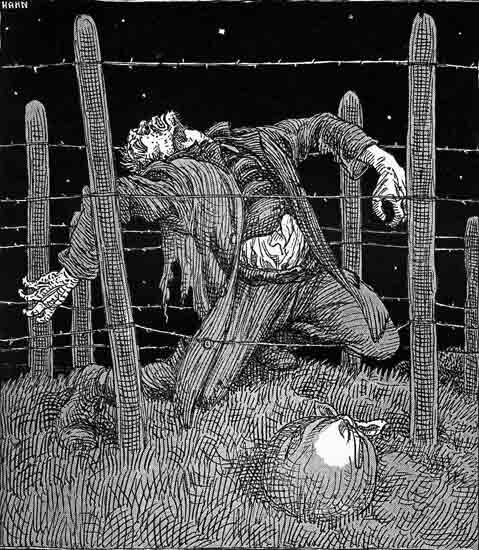 A Belgian boy, electrocuted by the fence. Many of the young Belgians who died here, were on their way to the Belgian army, that kept on fighting during the whole war in the south-western part of the country. These boys lived in the part of Belgium that was occupied by the Germans. Because crossing the frontline was not possible, they first had to go (neutral) Holland. From there they wanted to take a ship to England and then another ship to France from where they could travel back to free Belgium. The Electric Fence also destroyed cultural relations between Holland and Belgium. Before the war a large part of southern Holland was aimed at the Belgian towns of Liege and Visé. Most of these Hollanders spoke French (being the language in this part of Belgium). Four years and a Electric Fence later they had become used going to the Dutch town of Maestricht instead. The old customs never returned. Nowadays they don't even speak French anymore. A German military map of a part of the Belgian-Dutch border (near the Belgian villages of Achel and Neerpelt). The map shows the Electric Fence and also where the current came from. Different Krafwerke (powerstations) along the line supplied the 2000 Volts.